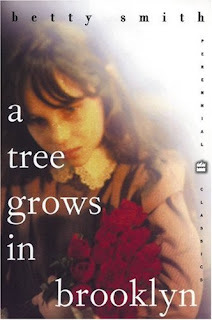 A Literary Odyssey: Review: A Tree Grows in Brooklyn by Betty Smith. I first read this novel in the tenth grade. It was the third or fourth week of school when I had a sit-down chat with my English teacher. On the second day of school, she had given us all a reading test-mainly to see how fast we could read and how much we retained. I did really well on the test (I read twice as fast as the next fastest reader). The catch was that we were all given individual reading assignments based on our reading speed and were given a goal number of pages to read each week. Technically we were supposed to read a little each night, but sometimes I would read for hours one day and not at all the next. It drove my teacher batty. Anyway, during this conversation we had, she told me there was no possible way I had read an entire book in 5 hours the previous Saturday. I argued with her and told her I would prove her wrong. Her catch was that I had to read something a little heavier in content, since I had mainly been reading science-fiction and fantasy novels to fulfill my page requirement. So that Friday, she assigned me a "lengthy" novel that I needed to have finished by Monday. On Monday she was going to ask me questions about the book to see if I had actually read it. 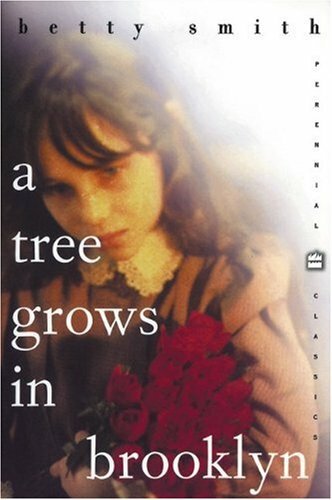 The novel she gave me was A Tree Grows in Brooklyn by Betty Smith. She told me it was a classic and would prove to be only a little challenging. I took it home a little annoyed, but that Saturday I sat on the couch and read it cover to cover. And loved it. Like Matilda the main character in this novel is a reader. I could relate to that in so many ways and I still can. It seems that as a reader, I gravitate towards characters who share that love. Francie Nolan is growing up in Brooklyn in 1911 when the story begins. Her family is poor. Her father is a drunk and her mother works hard to keep the family going on the little money she has. Francie and her brother chip in my collecting scrap metal for change. Her mother finds ways for five loaves of bread to last all week, and together they try and survive all the hard times. It is an incredibly moving and deep novel, about family and love and triumphs. It is also a sad novel, as Smith paints the portrait of the hopes we all put in dreaming big. The failures of Johnny Nolan to support his family and understand what they need always gets me. But I love the vision of hope it gives. Francie works to make things better for herself and triumph even when all odds are against her. She struggles to come to terms with things that are beyond her age and help support her family. On this reading, I was reminded of that first time I read it curled up on the couch and the wonder of discovering a new favorite book. In that moment I knew that my teacher had given me a gift. I wonder now about whether I would have discovered this gem if hadn't been for Mrs. Martin and her disbelief in my reading skills. Would I have ever given this a chance? I might even be as bold as to say that this is one of the first classics I gave a chance to become a favorite. It was after this that I picked up The Narrative of Frederick Douglass as well as a few others. I may even own that teacher for showing me that a classic can find a place in my heart, just as much as all those science-fiction and fantasy novels that I have forgotten the names of. And this time around, I still felt the same emotions that I did when I sat on that couch. I still hurt for Francie. And I still could understand her love for the books she surrounded herself with, her passion for reading and school. I still loved it every bit as much as I did that first time. But I discovered more to it this time. Instead of only focusing on little Francie, I looked her mother who worked so hard to support her family. I saw her sacrifices and pain as she watched her husband drink and ignore his family obligations. When the inevitable happens, I admired her strength. I can only hope that I can have that strength when I need it. When I closed the back cover, I thought about that weekend long ago, sitting on the couch and reading about Brooklyn and how it moved me. That Monday when Mrs. Martin quizzed me, I aced her questions. I had proven my point and she told me that I could read whatever I wanted from that point on. And I did, for the most part, but I also had her to guide me. Through her I began to discover literature that I didn't know existed. I read Douglas Adams, Neil Gaiman, Jane Austen, Frederick Douglass, and H.G. Wells in her room. I think I owe her, for showing me that classics don't have to be stuffy and that even when I think I have nothing in common with them, I very much do. This is a great commentary on your reading. It's kind of the thing I'm trying to do with my blog and this succeeded better than some of my lesser posts. I wish more bloggers put their reading into context, I think it's almost as important as the characters and plot sometimes. Also, darn you for making me add this to my reading list! Darn you to heck! I too love the fact that your post connects so much to your own story. Isn't it funny how often people find their most authentic selves in their almost petty efforts to prove something to somebody else? A wonderful post! I love to hear about your early reading inspirations. It also takes me back to my own, something I should give some more thought. Oh! This book is in my "december reading pile"! :") Now I am just more eager to read it! I have such fond memories of reading this book when I was young. Thanks for sharing your story with us, I love that you read it in one day. Aw, what a great story! I enjoyed this book, although there were some things I was frustrated by. 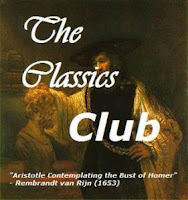 It's a good classic for people "afraid" of classics! Beautiful post, I so enjoyed reading it! Glad to hear you aced that test back then :-) I like the sound of this classic, it sounds really moving. I re-read this two years ago around Christmas time. Ever since then I've thought that it was a perfect holiday read as it serves as a reminder to appreciate the simple things and to be grateful for what we do have, rather than lamenting over what we don't. Reading it in one Saturday is no small feat! Lovely review. 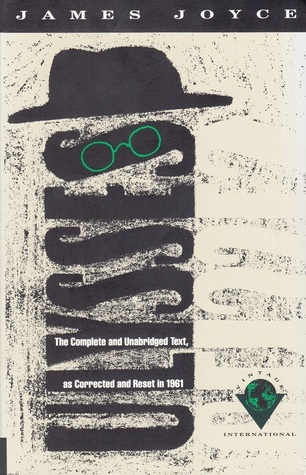 This book is on my 100 Best Books list -- one you can read over and over again, as those who have read it know. Aww, I love the personal narrative you attached to the review. I've yet to read this one but remember Amanda (I think it was Amanda?) commenting on it this past year.